Russian President says moves such as Trump's can "block paths" to the Middle East. 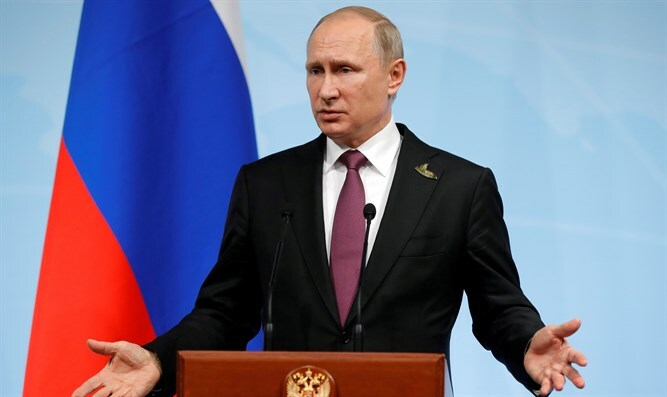 Russian president Vladimir Putin is "deeply concerned" by U.S. President Donald Trump's decision to recognize Jerusalem as the Israeli capital, the Kremlin said Thursday, according to AFP. In a telephone conversation with Turkish President Recep Tayyip Erdogan, Putin called for the Palestinians and Israel to "hold back" and renew negotiations. "This kind of measure can block possible paths to peace in the Middle East," the Kremlin said of Trump's move. Earlier, the Russian Foreign Ministry said Trump's decision threatened security and risked aggravating already complicated Israeli-Palestinian ties. "Moscow views the decisions announced in Washington with serious concern," the ministry said in a statement. It called on "all involved parties to show restraint and forego any action that would be fraught with dangerous and non-controllable consequences". Moscow stressed its traditional view that the two sides should negotiate their long-running conflict during "direct Palestinian-Israeli talks." Russia had also said it considers eastern Jerusalem to be the capital of a future Palestinian state, and western Jerusalem the capital of Israel. Putin’s statement came hours after the European Union’s (EU) foreign policy chief, Federica Mogherini, warned that Trump's decision could take the region "backwards to even darker times". "President Trump's announcement on Jerusalem has a very worrying potential impact. It is a very fragile context and the announcement has the potential to send us backwards to even darker times than the ones we're already living in," she told a press conference in Brussels. Mogherini, who meets Jordanian Foreign Minister Ayman Safadi in Brussels on Friday and Prime Minister Binyamin Netanyahu on Monday, called for cool heads, saying demonstrations against the decision should be peaceful. "What we truly need in these difficult times is wisdom and to listen to the wise voices calling for peace and peaceful reactions. We believe this difficult moment calls for an even stronger engagement for peace. The most urgent priority now is that all relevant actors avoid further escalating tensions on the ground," she said. Several other countries in Europe have criticized the move. British Prime Minister Theresa May said the British government disagreed with Trump's decision, adding it was "unhelpful" for peace efforts. "We disagree with the U.S. decision to move its embassy to Jerusalem and recognize Jerusalem as the Israeli capital," she said in a statement. "We believe it is unhelpful in terms of prospects for peace in the region". German Chancellor Angela Merkel said through her spokesman that she "does not support" Trump's reversal of decades of U.S. policy. "The status of Jerusalem can only be negotiated within the framework of a two-state solution," her spokesman, Steffen Seibert, wrote on Twitter. French President Emmanuel Macron, meanwhile, branded Trump's stance as "regrettable" and called for efforts to "avoid violence at all costs". Macron affirmed "the attachment of France and Europe to the two-state solution, Israel and Palestine living side by side in peace and security within internationally recognized borders, with Jerusalem as the capital of the two states."